What a story! Back in November more than 30 boys showed up for the first day of tryouts, hardly daring to hope for such a storybook ending. With only one senior and almost a score of freshmen, these young men weren’t sure they would survive the first week of conditioning. But one freshman was different. Quiet, scholarly, and humble off court, his court confidence and skill would have been mistaken for a senior on anybody’s team. Before long, Columbia’s Number 12 was circled and underlined on every Columbia scouting report among the state. Ben Gregg stands 6’7” tall and plays like a veteran, seldom giving any clue that a freshman heart beats under all that skill. 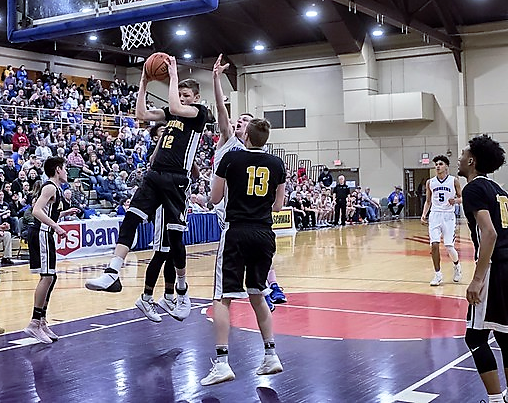 When the buzzer sounded late on Saturday March 3 in Pendleton, the Knights had secured the championship with a 65-61 win over Western Mennonite. 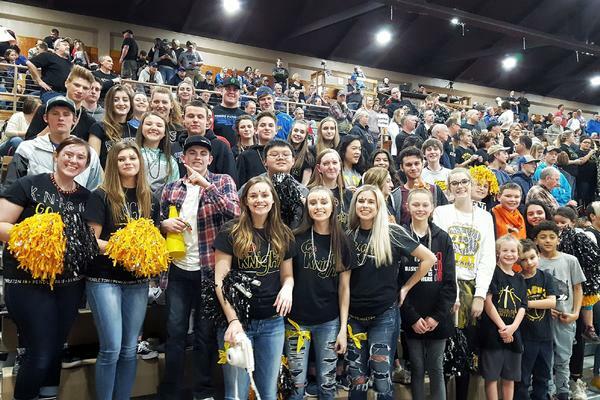 Elated smiles burst out on young faces who only four months ago were still figuring out high school, let alone a state basketball championship. Cheers, shouts of joy, and all manner of celebration burst forth from the alumni, parents, teachers, and students in the stands. Not a few parents shed tears of joy to see their boys work so hard and receive such a grand reward. Leading the charge, Gregg set a new tournament record with an incredible 51 rebounds in three games, breaking the previous record by 10. Gregg also led Columbia in scoring and ranked second overall for the tournament, winning a unanimous selection to the All-Tournament 1st team. In fact, every member of the team played with discipline and skill under intense pressure, and junior point guard Dominic Blake won a berth on the All-Tournament 2nd Team. 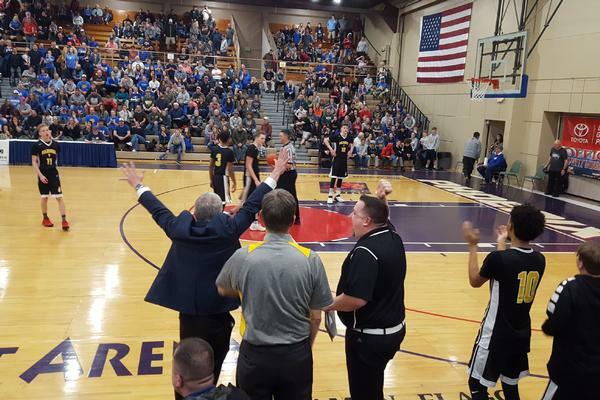 No one was happier than Head Coach Bart Valentine, who jumped up and shouted as the buzzer sounded, pointing upward to give credit to God. 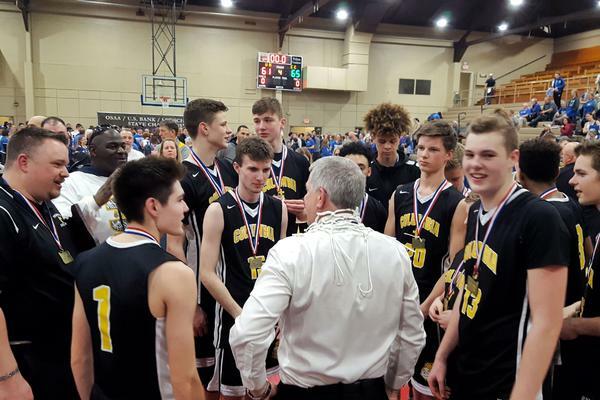 A noted molder of Christian men, Coach Valentine and his veteran coaching staff were more than a match for the team’s youth and inexperience. The archives of the school’s 70-year history reveal countless stories of how God has blessed Columbia with answers to heartfelt prayer. When the need arose last year for a new head coach, Valentine answered the call and became one of the latest answers to such prayers. Back in 1984, as a first-year head coach for Colton High School, Valentine coached his first state championship game at Pendleton, losing by one point. He told himself that he would be back. 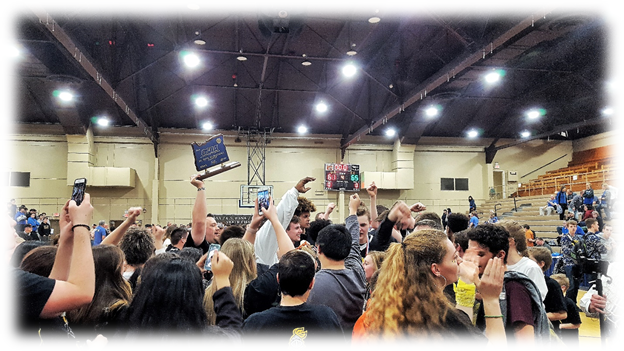 It took 34 years, but winning the 2018 Class 2A Championship title was a magical moment. 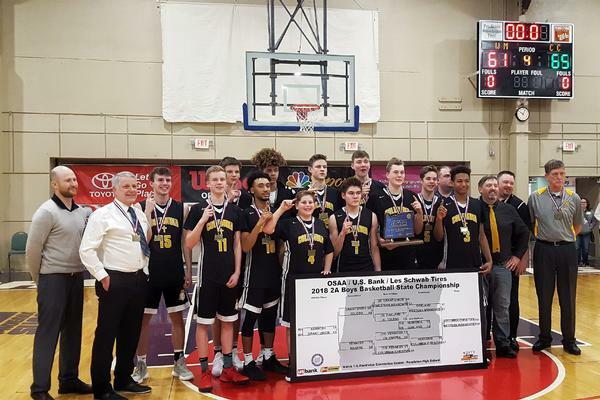 Coach Valentine commended the team for the maturity gained in the course of the season that enabled them to maintain their discipline and focus in spite of relentless pressure from the Mennonite team that commenced with the opening jump and didn’t let up until the final buzzer. Valentine gave credit to assistant coaches Jim Flint, Robby Chandler, and Sid Astin, who each made invaluable contributions to shaping the championship team. 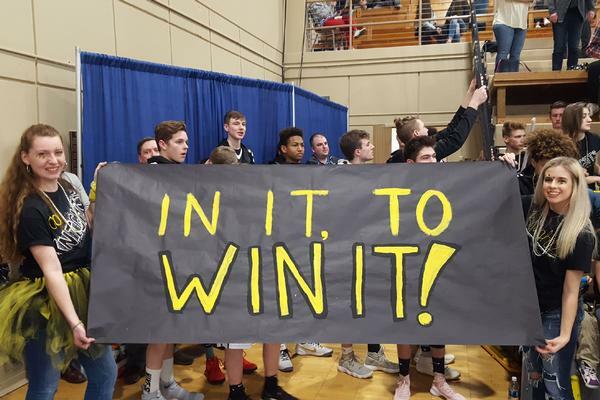 It’s too early to talk about a four-year run for the title, joining the likes of Jesuit and West Linn, but alumni, parents, teachers, students, and all the Columbia fans who stood in the bleachers that night think otherwise. One thing is for sure, the Knights are no longer the young team led by one senior.